Chiropractic adjustments (spinal manipulation) and therapeutic massage are both wonderful treatments for reducing pain, restoring mobility, and improving overall health and wellness. When combined, these compatible therapies enhance each treatment, helping improve musculoskeletal and nervous system function, posture, and circulation. Chiropractic care focuses on the nervous system, the musculoskeletal structure, and hard tissues, while massage therapy deals with the soft tissues. Knowing how these treatments work together to compliment one another can greatly improve your musculoskeletal function, thus boosting your overall health. 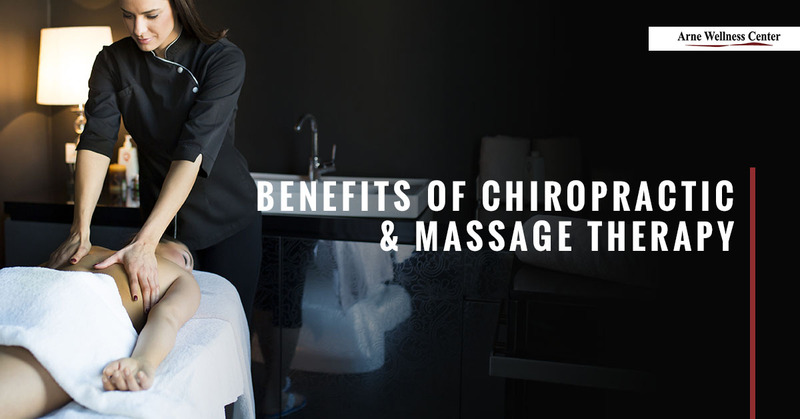 We at Arne Chiropractic in Littleton care deeply about your our patients’ wellness and have therefore composed a list of benefits our patients receive from combining chiropractic and therapeutic massage treatments. Please continue reading below. Massage therapy focuses on manipulating the soft tissues like muscles, tendons, and ligaments to improve circulation and increase blood flow which warms these soft tissues, causing them to loosen and relax. Our skilled massage therapists apply light, moderate, or deep rhythmic hand, arm, and sometimes elbow movements which help to alleviate muscle pain, soreness, and stiffness, while also increasing flexibility. Using various massage techniques, therapeutic massage greatly improves circulation, reduces muscle tension and stiffness, and promotes relaxation. Stimulating circulation delivers nutrients and oxygen that enhances healthy muscle function, which promotes quicker healing, decreases pain, and can even help prevent possible injuries. This process helps muscles get rid of lactic acid which collects in our muscle fibers, often causing painful muscle spasms and stiffness. In addition to soft tissue manipulation, massage therapists often integrate hot packs to warm the muscles (barring any inflammation), active and passive stretching, reflexology, myofascial release, herbal remedies, essential oils, topical pain relievers, and aromatherapy into their treatments. A therapist’s healing touch promotes relaxation, while decreasing muscle ache associated with tension and spasms, leaving the client feeling loose, limber, and relaxed. As already mentioned, therapeutic massage treatments focus on the soft tissues, while chiropractic manipulations address the nervous system and musculoskeletal dysfunction related to hard tissues like the spinal column, joints, and bones. These hard tissues are enveloped by muscles, tendons, and ligaments, so when muscles are tight, tense or injured, they pull joints and bone structures out of alignment. By arming, loosening, and relaxing the soft tissues before a chiropractic adjustment, hard tissues and joints adjust easier, as tight muscles can sometimes make it difficult to manipulate bone structures. Because chiropractors perform more extensive physical examinations, make medical diagnoses, recommend diagnostics and other tests, they can help massage therapists identify and treat specific musculoskeletal dysfunctions. Receiving chiropractic care after a therapeutic massage increases the effectiveness and longevity of both treatments, improving range of motion, stimulating faster healing, extending the length of both treatments, and improving overall health function. As already mentioned, therapeutic massage increases relaxation, reduces stress, and can help calm tension and anxiety. For some people, the thought of having their neck and back adjusted adjusted is a terrifying concept. Many people tense up prior to their chiropractic adjustment, which can make it challenging for the patient to relax. Because massage therapy encourages relaxation and minimizes stress, it is an effective treatment prior to receiving chiropractic care so that the body is less tense, and the patient is relaxed and calm. We at Arne Wellness Center strive to provide our patients in the Littleton area with optimum health and wellness care. Our priority is to offer fast, lasting relief from a number of musculoskeletal dysfunctions, while helping you maintain healthy function. Please call us today to request your next chiropractic and massage therapy appointment. We look forward to helping you heal!